Hello and welcome to Day 2 of our December Digital Stamp Release Showcase! On Monday ( December 3rd ) Whimsy Stamps released this month's new digital designs, From then until 6th December the Whimsy Digital DT are showcasing these fabulous new goodies with a daily mini blog hop and I am part of today’s hop! To be entered into today's mini blog hop prize draw, be sure to leave a comment on ALL of the DT's posts listed below by 12.00PM EST tomorrow. Here is my creation for Day 2 of the release. I used this wonderful image designed by Crissy Armstrong called "Addie The Acrobat". 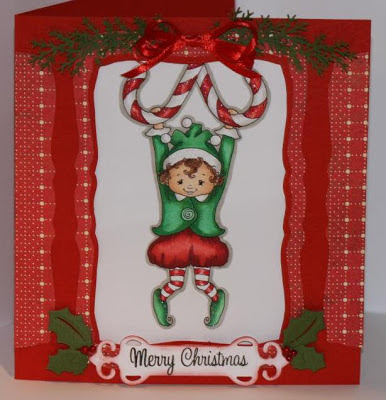 When I made the card I put the image behind the cut out piece and foam squared it up to give it dimension with her hanging from the candy canes. I decided to keep this card clean and fairly simple. I hope you are enjoying the hop and that my card has inspired you to create today. Supplies: Whimsy digital image "Addie", spellbindersCurved rectangles, Fancy Tags & Little Leaf set, Martha Stewart branch punches, copic markers, Kaiser Craft pearls, Star Dust stickles, ribbon, Bazzill Cardstock & Basic Grey patterned paper. Have a wonderful day, see you soon. Awahhhh, your shading is beautiful! Aaawww... What a cute little elf. 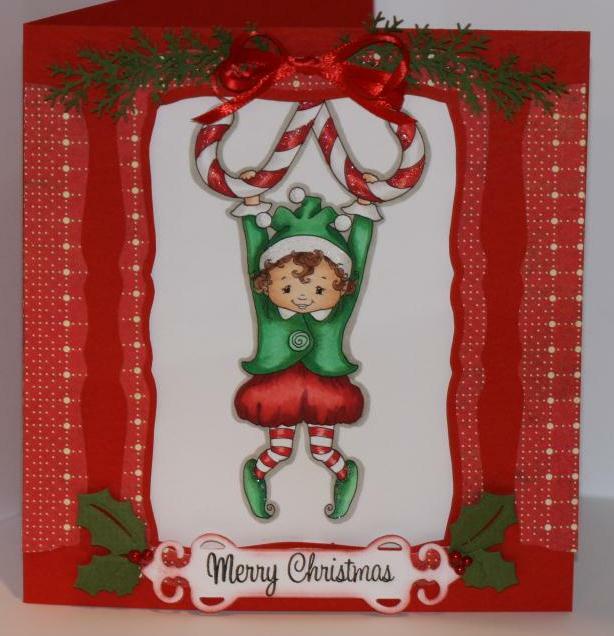 Cute card..such a fun & devilish elf..reminds me of my grandson Russell! Great, love the red, nicely done!